Tribocorrosion causes the degradation or alteration of materials through the combined action of corrosion and wear. It limits the performance and life-time of installations, machines and devices with moving parts, and controls certain manufacturing processes such as chemical–mechanical polishing. The effects of tribocorrosion are most pronounced on passive metals which owe their corrosion resistance to a thin protecting oxide film. Most corrosion-resistant engineering alloys belong to this category. This book provides an introduction to the developing field of tribocorrosion and an overview of the latest research. Part one reviews basic notions of corrosion and tribology, before presenting the most recent results on the growth and structure of passive oxide films. Tribocorrosion mechanisms under fretting, sliding and erosion conditions, respectively, are then discussed. Part two focuses on methods for measuring and preventing tribocorrosion. It includes chapters on electrochemical techniques, the design of tribocorrosion test equipment, data evaluation and the optimisation of materials’ properties for tribocorrosion systems. Part three presents a selection of tribocorrosion problems in engineering and medicine. Three chapters address the tribocorrosion of medical implants including test methods and clinical implications. Other chapters examine tribocorrosion issues in nuclear power plants, marine environments, automotive cooling circuits, elevated-temperature metal working and chemical–mechanical polishing. 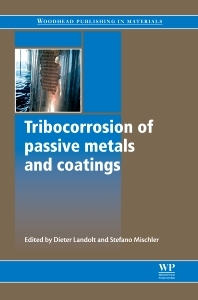 With its distinguished editors and international team of expert contributors Tribocorrosion of passive metals and coatings is an invaluable reference tool for engineers and researchers in industry and academia confronted with tribocorrosion problems. Engineers and researchers in industry and academia confronted with tribocorrosion problems. Dieter Landolt is Professor Emeritus at the Swiss Federal Institute of Technology Lausanne (EPFL), Switzerland and is widely regarded for his research expertise on corrosion, tribology and the protection of metals. Stefano Mischler is a Senior Scientist at the Swiss Federal Institute of Technology Lausanne (EPFL), Switzerland and is widely regarded for his research expertise on corrosion, tribology and the protection of metals.